Ever since Christmas, I've been playing a lot of board games. Lots and lots. All designed for little people. This is by no means a comprehensive list of board games designed for kids -- but it's the handful we've been playing. Cootie. This is one I played as a kid. It's super-simple. Roll the dice. Obtain the corresponding bug part. Build your bug. Run around the house and play with the cootie bug afterwards. My kiddos have been playing this one for some time. They learned some pretty handy board game skills -- like taking turns and rolling a dice. (Dice-rolling, I learned, is counter-intuitive. If you need a six to win, why would you try to get a six by dropping it, instead of setting it on the right face? We used a cup to roll the dice for a while). Super-simple game, cool components. Candyland. Players draw a card on their turn and move to the next spaces the matches the color on the card. There are some special cards that transport the player to a particular spot, and some spaces that do good or bad things. The hardest part of this game is figuring out which direction is forward on the twisty, wiggly path cutting through abundant illustrations. But I think the illustrations are also a large part of why the children like the game. Sequence for Kids. This is my favorite, and the reason I decided to write this post, because I'd never heard of it before. I thought it would take my kids some time to learn, because it's a more complicated game where playing actually requires strategy (Cootie and Candyland are completely random). Each player has a hand of three cards. Each turn, they play one card and place one of their chips on one of two corresponding spaces on the board. The first to get four chips in a row wins. There are four free spaces, and two special cards: a unicorn that allows the player to play anywhere, and a dragon, which allows players to remove a chip. Everyone learned the rules, if not the strategy behind winning, quickly. I was pleasantly surprised at how this worked for both ages in my house. The youngest just plays whichever animal he likes best. The 4yo has caught on that the choices he makes influences the outcome of the game. He's still learning the strategy, but he's abundantly fond of blocking people. Cootie was a great game to learn some basic game-playing skills on and have a good time, and I feel Candyland is in that same vein. This game feels like a great first step into strategy. And because there's strategy, it's one I'm happy to play over and over. 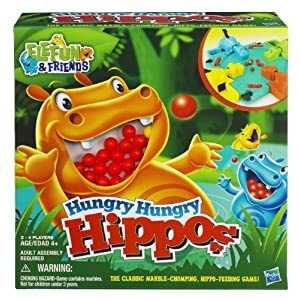 Hungry, Hungry Hippos. No taking turns. No strategy. Just chaotic marble-chomping. I don't know why, but there's something oddly relaxing about lever-mashing and hoping for marbles at the end. Kids think this is hilarious. Lots of fun -- which is, after all, kinda the point of games. Anyone have some favorite kid's games? We got a great one for Christmas called "Orchard". It's a cooperative game for 3 and up. My boys *love* it and Scott and I enjoy it, too. The game is very simple but surprisingly fun. That sounds great! I hadn't run across any kids' co-ops before.